“I can draw a direct connection between my Saint Mary experience and some of the most important accomplishments of my adult life. Saint Mary is where I honed critical thinking skills, experienced caring, committed, personalized instruction on a variety of world-expanding topics, and where I made life-long friends who continue to enrich my life. Karyn’s mother attended the college — Sarah Brown Wyrick, C’68. “I received an excellent education that has served me well throughout my brief business career, and later as leader of several organizations. It gave me a basis of how important charity work is. This inspired my husband, Don, and I to share what we have to provide young students the opportunity to receive a quality education that they might not be able to afford otherwise. 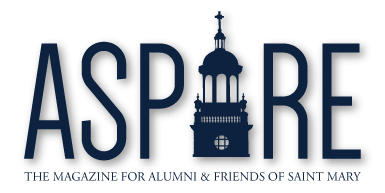 “I started giving to Saint Mary because my mother was so loyal to our alma mater. She cherished her memories of Saint Mary, starting high school at the academy, and continuing on through college. “Why do we give? Quite simply because we love Saint Mary. My time at Saint Mary was possible only through the goodness of scholarships and financial aid. I reaped a solid and inspiring education that taught me to think, to question, and to believe in myself. I developed life-long friendships that continue to flourish some years 45 later. I give because someone cared enough to give, so that I could have an opportunity. I’ve gone on to medical school, got a degree from Harvard, and started my own company—all made possible by scholarships and alumni giving. “I gladly give because the generosity of the Sisters of Charity and the Jubilee Scholarship gave me the opportunity to attend college. That generosity led me to the place I consider my second home—Saint Mary. “I happily give because the value-centered education at Saint Mary has significantly impacted my efforts in work and in life. The university provides great opportunities for those wishing to better themselves through academic study and athletic achievement. “I joyfully give because had a wonderful college experience—due to the sisters’ loving care. I arrived at Saint Mary as a very naïve 16 year old, and left Saint Mary as a responsible and respectful young lady. “I came to campus in 1966 after receiving a scholarship to complete a bachelor’s degree in Nursing Education. Though I was already a licensed Registered Nurse, I had attended a diploma nursing school and really wanted a career in teaching nursing. Obviously, the scholarship to Saint Mary was the answer to my prayers. I was lucky enough to be offered a “Fellowship,” too, and became one of 5 “Infamarians.” Without this financial support, I would not have been able to achieve my dream. I credit saint Mary and the wonderful faculty in the nursing department with the success I have achieved in the health care industry as a teacher and later as a home health administrator. My liberal arts education opened a new world of art, music and poetry. One of my favorite memories is taking “Art of the Play” from Sister Dolorita. We always prayed before class for the tormented soul of Tennessee Williams and she then entertained us with enactments of scenes from his plays. Mind you, she brought to life Blanch Dubois, while standing on the desk at the front of the room! “I am very thankful for the education that I received at Saint Mary. Students were never a number and it was so beneficial to have faculty that cared about your personal development as well as your educational achievements. As the years go on, the more I appreciate the value of Saint Mary’s liberal arts instruction with an emphasis on critical thinking. “I give to Saint Mary because of the faculty and staff that taught and mentored me while in college and throughout my life. I give because of Sister Mary Janet, who knew my name the day I stepped onto the campus in the fall of 1969. I give because of the impact that Sister Edward Mary Brown, Sister Mary Ernestine Whitmore, Sister Barbara Sellers, Sister Marie Therese Bride, Sister Carmen Echevarria, Jeannie Harrington Downs, Mary Morgan Levenson, Sister Irene Skeehan, Dr. Sirridge and so many, many more had on my teaching career and life. Not just the “how to” lessons, but more importantly, their personal example, their teaching styles, their generous, loving and caring way of accepting everyone. Saint Mary pushed us, encouraged us, supported us, challenged us, praised our successes, invited us to broaden opinions and sharpen our convictions. I give because of the people of Saint Mary. “I give to Saint Mary because my college education shaped who I am today. A strong belief in service and giving are hallmarks of a Saint Mary education. For two years I was the fortunate recipient of the Dr. Agnes Sirridge History Scholarship. I feel strongly that we should give back to those who gave to us. I give to honor my parents. As one of six children, they provided me with financial and emotional support during my college years. I was grateful for the roof over my head and the meals on the table during semester breaks, and even after graduation, as I struggled to find my place in the world. “Saint Mary with the SCLs and the college faculty has always been like my second family. My mother walked its lanes to attend the Junior College in the late 1920s. I walked those same lanes and over those many bricks during my college years. My Saint Mary education is something that has followed me my entire life. Over the years, I have repeated her name to many friends and work associates. Yes, I am eager to share the fact that I went to Saint Mary College. I also want other students to get a Saint Mary education and also convey their experience with others. This is what Scholarship giving and alumni loyalty is all about. Saint Mary has been an important influence in my personal wife and working career. Scholarship giving is my way of saying “thanks” not only for my education but for so many intangible experiences received. I want Saint Mary and her professors to continue making a difference in student lives for years to come.